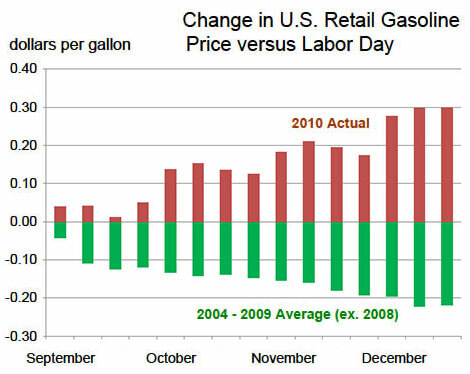 If you’re going to invest in an alternative-fuel vehicle, you might want to check where you can fill up. The city you’re in makes a difference. For those relying on biodiesel, you’re good to go in Austin and not so bad in San Antonio, recent data from DriveBiodiesel.net shows. Dallas has a broad mix of E85 and natural gas pumps, according to E85Locator.net and CNGLocator.net. Houston has a decent spread of E85 stations. West Texas? One station, in Midland. Natural gas. One thing’s for sure, if you want to take a road trip in an alternative-fuel vehicle, plan well. Some places will leave you with fumes. Wow. Look at this gorgeous rolling ribbon of road and bluebonnets. 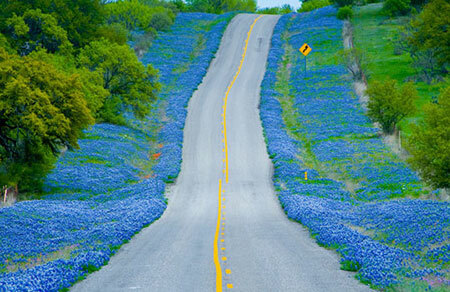 This Texas Hill Country highway made msn.com’s top 10 scenic drives in the U.S.
Texas Hill Bluebonnet Tour, from msn.com's "10 scenic spring drives"
“If you want to see fields and fields of bright blue flowers resting atop a bed of emerald green grass, look no further than the annual Texas Hill Bluebonnet Tour,” it says. But not all is so flowery. “Wild about wildflowers? 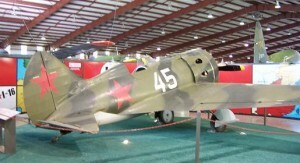 Too bad,” says an Express-News story posted yesterday, which lament’s this year’s spotty blooms. Unlike last year’s lush bounty, fed by more than 10 inches of rainfall, this year’s blooms will be small and scattered due to just a third as much rain since Jan 1, according to the report. Meanwhile, look for the color to peak in early April. Lots of people have their Internet compulsions and addictions: Facebook, Farmville, YouTube, eBay, video games, and so on. My wife is a recovering Pinterest addict. 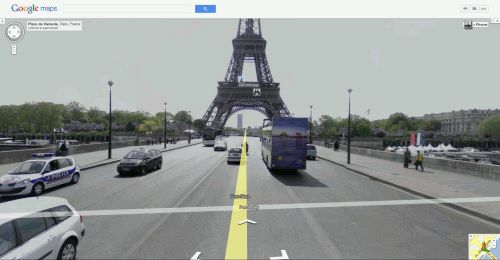 My web vice is Google Maps Street View. I’ve always been a spatial kind of guy. I instinctively know which way is North. I was telling my mom how to get home from the airport when I was four. My degree is in Geography. I have no need for a GPS. And I love to travel. Mostly, I’m a it’s-not-the-destination-but-the-journey kind of guy. I love watching the scenery go by, seeing new places in fast-forward. Of course, that comes from being a transportation-enthusiast. Getting from Point A to Point B is often my favorite part of vacations. Heber Springs, Ark., a friendly town of 6,000 that tourists swell to 30,000. 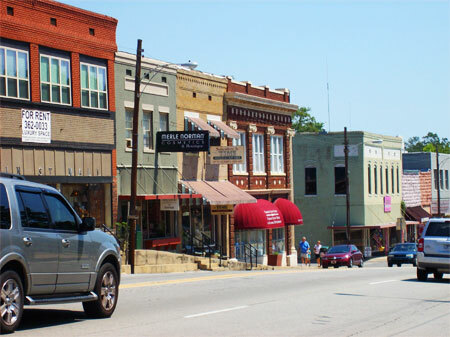 Driving through the pine forests of East Texas, on the way to Central Arkansas, you pass signs for places like New Boston, Pittsburgh, Mount Pleasant and even Paris. It’s almost like pioneers started running out of names by the time they got to Texas. But things get a bit more imaginative once you arrive at the Arkansas border. Names there start off with morphed incarnations like Texarkana, and later dish up tidy permutations such as Arkadelphia. You know, Oklahoma’s just a short jog to the west, I thought. Could it be? Is this some sort of an Arkansas localism? Perhaps it was pranksters? The nation’s economic recovery seems to be slowing down, but not travel plans to enjoy the last days of summer. Some 34.4 million Americans are making trips this Labor Day weekend, according to an AAA survey, up 9.9 percent from last year’s dismal showing. Vacationers will also spend more this year, the survey shows. Median spending is expected to be $697, up nearly $50. Travelers are expected to pay more for airfares, 9 percent higher; car rentals, up 7 percent; and hotels. But one thing they won’t be spending more on is gas. Regular unleaded, now averaging $2.68 a gallon, is down almost 20 cents from the spring, an AAA report says. Texas prices are averaging $2.51. Meanwhile, nine out of 10 people are traveling by car this holiday weekend.